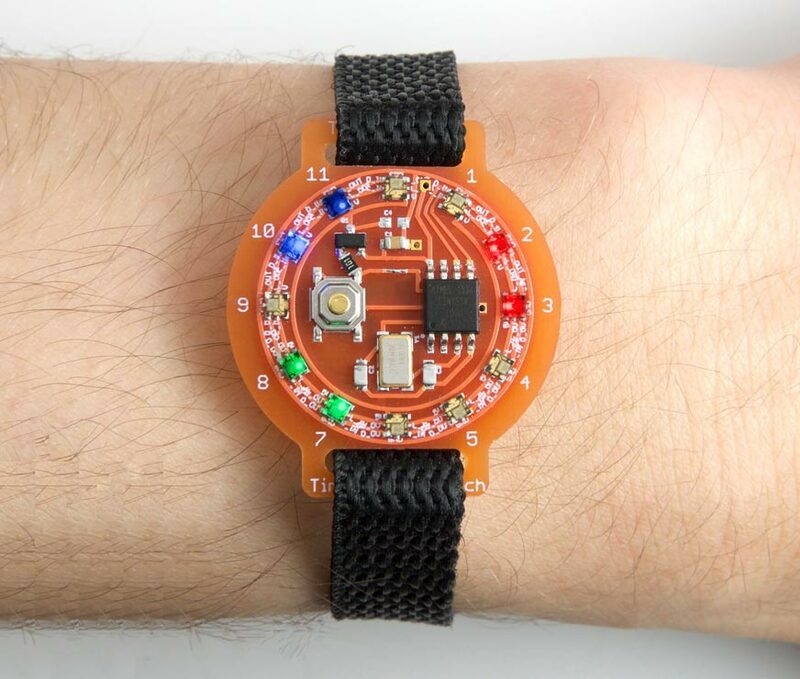 The Tiny Colour Watch based on an ATtiny85; it's twelve minutes past ten and 37 seconds. To show the time you press the button on the watch face; the display is blanked after 15 seconds to save the battery. The ATtiny85 is clocked by a crystal, ensuring that the time is accurate to within a few seconds a month. This is the third of my LED-based watch designs. My earlier Tiny Time 2 Watch used monochrome LEDs, and distinguished between the hour and minute hands by flashing the minutes LED. I thought I had taken the Tiny Time watch concept as far as it could go until I read about the APA102 LEDs, full colour LEDs in a 2020 package that cost under $5 for a dozen. You can control them using a two-wire serial interface, and daisy-chain a virtually unlimited number of them together, with individual control over the colour and brightness of each LED. I realised that this would allow me to design an ATtiny85-based watch, using two I/O lines to control the 12 RGB LEDs, two I/O lines to connect to an external crystal, and one I/O line free to connect to a pushbutton to display the time. Because the timing is performed by the ATtiny85 there's no need for an RTC chip. The circuit looks more complicated than it actually is, because the LEDs are simply in a daisy-chain; I've arranged them in a circle to reflect how they're laid out on the watch face. The LEDs are APA102-2020 serial-controlled RGB LEDs. I bought mine from Maleectronic on Tindie , or they are also available from AliExpress . Although they are specified as needing a 5V supply, I found they work reliably down to 3V, although at this voltage the blue LEDs are slightly less bright than the red and green LEDs. The resistor and capacitors are all 0805 size components. For the crystal I used an ABM3B 8MHz SMD type, which needs 10pF capacitors , although any 8MHz SMD crystal should be suitable. The button is a miniature SMD push button available from Sparkfun , available from Proto-PIC in the UK . Although the watch will work with a CR2032 coin cell, I recommend using an LIR2032 rechargeable lithium coin cell; as well as being more economical, it gives a slightly higher voltage of 3.7V rather than the CR2032's 3.0V, which makes the blue LEDs brighter . If you do use a CR2032 you might want to use the blue LEDs for the seconds, so their brightness is not so important. The battery fits in an SMD 20mm coin cell holder available from Sparkfun , or from Proto-PIC in the UK . After trying out a prototype I realised that the APA102 LEDs draw about 11mA even when all the LEDs are turned off, which would limit the watch's battery life. I therefore added a P-type MOSFET as a high-side power switch, to allow the processor to turn off power to the LEDs when the display is off. There wasn't a spare I/O pin I could use to drive the MOSFET, but fortunately I could make the switch input double up as the power enable; pressing the switch both enables the display, and generates a signal to wake up the processor. The main criterion for the MOSFET is that it should have a low turn-on voltage, VGS, of under 2.0V. It should also be able to handle the current drawn by the LEDs; this is 20mA with a typical time display. I chose the Fairchild FDN306P, with a VGS of 1.8V, which is in an SOT-23 package . In my first prototype I didn't include the 100Ω resistor in the gate of the MOSFET, and I couldn't understand why the ATtiny85 reset every time I pressed the button. After a bit of research I realised that the gate capacitance can cause a large current spike when the MOSFET switches; the solution is to add a small series resistor. There's a link to the Eagle files at the end of the article if you want to make yourself a board. The completed Tiny Colour Watch circuit board. The AP102-2020 LEDs are pretty tricky to solder, and I don't think it would be possible with a normal soldering iron. The procedure I used was to mount one LED at a time by applying a small blob of solder paste to each pad with the tip of a pin, and I then gently placed the LED in position with a pair of tweezers. I then heated up the LED with a Youyue 858D+ hot air gun set to 250°C until I could see the molten solder glistening around the base of the LED. Once the solder melts, surface tension tends to centre the LED correctly on the pads, so the initial placement isn't too critical. Once all the SMD components were soldered on the front of the board I finally soldered the battery holder onto the back of the board using a conventional soldering iron. A start frame of 32 '0' bits. A 32-bit frame for each LED, specifying the brightness and colour. An end frame of 32 '1' bits. Five bits specifying the brightness, MSB first. Eight bits specifying the blue component, MSB first. Eight bits specifying the green component, MSB first. Eight bits specifying the red component, MSB first. Tim Böscke has analysed the APA102 and determined that the end frame actually only needs to contain a number of bits equal to half the number of APA102s in the chain , so with 12 LEDs we only need 6 bits. The watch hands are represented by different colour LEDs. I chose blue for the hour hand, red for the minute hand, and green for the second hand. The position of each hand is represented by the proportional brightness of two adjacent LEDs. For example, when the minute hand is at five past the hour LED 1 is at 100% red and LED 2 is off. At six minutes past the hour LED 1 is 80% red and LED 2 is 20% red, and so on until at ten past the hour LED 1 is off and LED 2 is 100% red. It repeats this every second until the display is blanked, after the specified timeout interval. When you first apply power to the watch it runs SetTime() which allows you to set the time to the nearest second. It works as follows: wait until the current time is an exact number of minutes, and insert the battery. The watch will then start from 12:00, stepping through the display, advancing one minute every fifth of a second. When the watch shows the time you inserted the battery, hold down the button until the green seconds LEDs appear. The watch will account for the additional time it took you to set the time, and display the correct time accurate to the nearest second. To maximise the battery life the program slows down the processor clock by a factor of 256, whenever the display is blanked, from the normal 8MHz to 31.250kHz. With the display blanked the current consumption is about 0.24mA at 3V. A typical CR2032 battery has a capacity of 225mAH, so it should last over a month. I compiled the program using Spence Konde's ATTiny Core . Select the ATtiny x5 series option under the ATtinyCore heading on the Boards menu. Then choose Timer 1 Clock: CPU, B.O.D. Disabled, ATtiny85, 8 MHz (external) from the subsequent menus. I connected to the ATtiny85 using a clip that fitted to the top of the chip , using the Sparkfun Tiny AVR Programmer . Choose Burn Bootloader to set the fuses appropriately, if necessary, and then choose Upload to upload the program. Here's the whole Tiny Colour Watch program: Tiny Colour Watch Program. 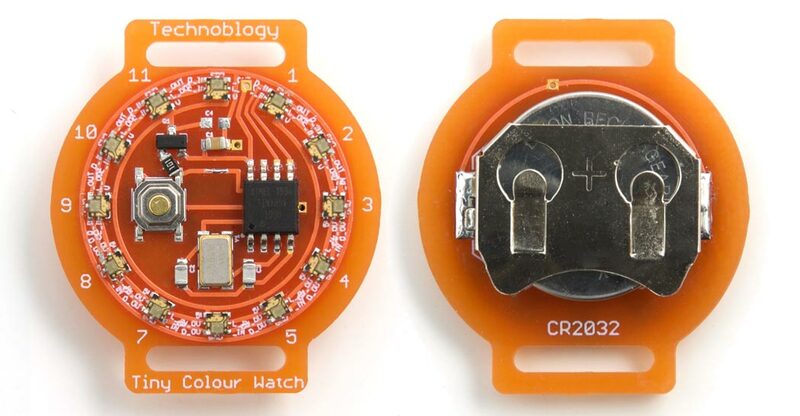 Alternatively, get it on GitHub here together with the Eagle files for the PCB: Tiny Colour Watch on GitHub. Or order a board from OSH Park here: Tiny Colour Watch Board. 13th February 2019: Due to the popularity of this project I've added a parts list, to help in sourcing the components. ^ APA102-2020 RGB LED from Maleetronic on Tindie. ^ DotStar Micro LEDs APA102 2020 from Jiufeng Lighting on AliExpress. ^ ABM3B 8.000MHz Abracon Crystal SMD on Farnell.co.uk. ^ Mini Push Button Switch - SMD on SparkFun. ^ Mini Push Button Switch (SMD) on Proto-PIC. ^ Button cell (rechargeable) LIR2032 on Conrad Electronic. ^ Fairchild FDN306P P-channel MOSFET on RS-Online. ^ Understanding the APA102 "Superled" on Tim's Blog. ^ IC test Clip - SOIC 8-pin on SparkFun.